HomeBlogThe BibleDo We Take Ourselves Too Seriously? Matthew tells the story about Jesus asking his disciples, “Who’s the greatest in the kingdom of heaven?” The disciples don’t answer. Either they don’t know or they’re afraid to attempt an answer, for fear they might be wrong. Change: The first requirement to enter God’s kingdom is to change. Another word for this is repent. Think of this as making a U-turn. To turn our lives around and follow Jesus. This change may involve our attitude, our priorities, or our actions. Maybe all three. We need to change and follow Jesus. Become Like Children: Once we change, Jesus tells us to become like children. What does this mean? I don’t think Jesus is giving us permission to act childish. That would be an excuse for irresponsibility. 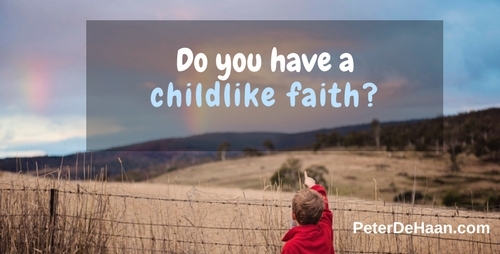 Instead it may be a call for a childlike faith. Little children are so trusting. They believe in their parents unconditionally, who they know will take care of them. These parents want the best for their kids and will do anything for them. These kids know that. Jesus wants us to look at him the same way, as children with unwavering trust. 2) Become Great: When we assume this lowly position as a child, Jesus says we will become the greatest in the kingdom of heaven. 3) Welcome Jesus: Furthermore, if we welcome a child in Jesus’s name, we welcome him. Think of the things we would do for Jesus if he were suddenly standing in front of us. Now we need to go do that for his kids. As adults we sometimes take ourselves too seriously. Perhaps we do this most of the time. Jesus’s call to change and become like children may be a call for us to loosen up and love him with unabashed passion, just as small kids love their parents.